Saturday’s “Night of Wheels” at Oakshade Raceway was packed full of great racing action, Vintage American Race Cars (VARC) and a lot of happy kids. Rusty Schlenk increased his point lead over Casey Noonan after fending off a very fast Matt Miller to earn his third UMP Late Model feature win of the year. Fans of old-time race cars were treated to the VARC exhibition with all kinds of restored race cars from the past century. Finally, nearly 80 donated bikes, trikes, scooters and more were given away at intermission to a bunch of lucky kids. UMP Late Model feature front row starters Steve Kester and Kevin Reeve raced side by side the first couple laps of the 25-lap feature. With Kester leading, Schlenk worked his way into second on lap three with Matt Miller following in his tire tracks. The first caution flag came out for Ky Harper’s spin on lap 11. On the ensuing restart, Schlenk charged to the lead. John Bores got turned on the front stretch one lap later which brought out another caution flag. Shortly after that restart, Dona Marcoullier spun in turn two while running in the top five for the final yellow flag of the race. Miller eventually got around Kester for second and then had a heated battle with Schlenk the final 10 laps of the race. Miller looked high and low trying to find a way around the 91 car of Schlenk, but the Weston, OH driver managed to hold the lead. Miller did manage to get alongside Schlenk and even led lap 23 by a nose, but Schlenk battled his way to a very close and exciting feature win. Brian Ruhlman finished third behind Miller with Jeff Babcock having another impressive run to finish fourth after starting 12th. Devin Shiels was fifth. Bruce Stuart took the lead from Richard Patton on the second lap of the UMP Sportsman feature. Matt Lindsey quickly closed in on Stuart and began to challenge for the lead. Lindsey went to the inside of Stuart and took over the race lead for good on lap nine. Lindsey pulled away to win his second feature of the year which leaves him second in the point standings behind last week’s feature winner, Bob Gregory. Mike Jessen sits third in points and finished second in the race with Gregory taking third. Tim Line was fourth with Tim Fisher fifth. Terry Rushlow and Jeff Foks had won all but one of the UMP Bomber A Mains this year with the vast majority taken by Foks. Those two drivers started on the front row and battled just about the entire race for the lead. Rushlow started on the pole and took the lead at the start. Foks started on the outside and slid up a little high in the first set of corners to slip back to about fifth. Foks recovered back to second by lap two and began to close back in on Rushlow. While battling for fourth Craig Dippman got in the rear of Jim Remley on the front stretch on lap seven sending Remley spinning toward turn one before his wheels dug in. Then Remley’s car rolled over and ended up on his side to bring out the red flag. After the restart, Rushlow and Foks pulled away from the rest of the pack and had their own battle at the front. A late caution for debris on the track set up a two lap race to the finish. Rushlow held off Foks to earn his second feature win of the year. Joe Overmyer finished third with Curt Lancaster climbing to finish fourth after starting 10th. Jeff Geis was fifth. William Cundick got turned around in the first corner of the Hornet feature race which resulted in a complete restart after Taylor Dippman got caught up in the incident. “Sparky Marky” Gillingham wasted no time getting in front of Brandon Myers for the lead at the start. Myers pressured Gillingham early, but Gillingham went on to pick up his fifth Hornet feature win of the year. Myers had to settle for second. Devon Bell, Cody Laney and Drew Smith were the rest of the top five finishers. The competitors in the UMP Sport Compact feature fanned out six-wide at the drop of the green flag. Last week’s winner Trent Delong started last and gained the lead as the field went through the first two corners. He would go on to an easy win. It was Delong’s second feature win. Derek Morris held off Jeff Wells to finish second followed by Regan Ford and Stephanie Miller. The UMP Bomber B Main had three different leaders the first four laps of the race. Roscoe Stetten led lap one. Justin Gamber held the lead on laps two and three and then Chris Sands took command on lap four. Gamber spun on lap five to bring out the yellow flag. A few more cautions kept the field tight with Dave “Gumby” Golembiewski Jr. right behind Sands. Those two drivers got hooked together going into turn one after a late restart. Sands managed to hold on to the lead and the eventual victory, but Golembiewski slipped up high in turns one and two and fell back a few positions. Richard Riffe finished second while Tony Tolles ended up third after starting at the very back of the field. Satch Crispen was fourth and Golembiewski wound up fifth. Teri-Lynn Murphy took the lead from Derek Zuver on lap two in the final race of the night, the UMP Bomber C Main. Just after giving up the lead, Zuver spun to bring out the caution flag. Murphy drove a little too high into turn three on lap five which allowed Charles Stuckey to move to the inside and briefly take the lead. Murphy collected herself and got back alongside Stuckey and passed him for the lead. She went on to pick up her first feature win. Stuckey settled for second. Mike Grames finished third followed by Russell Nickoloy and Adam Lantz. Oakshade Raceway will host a special Fourth of July 200-lap/Two Hour Enduro race on Wednesday afternoon. Gates open at 12pm with the race starting at 2pm. General admission is just $3. 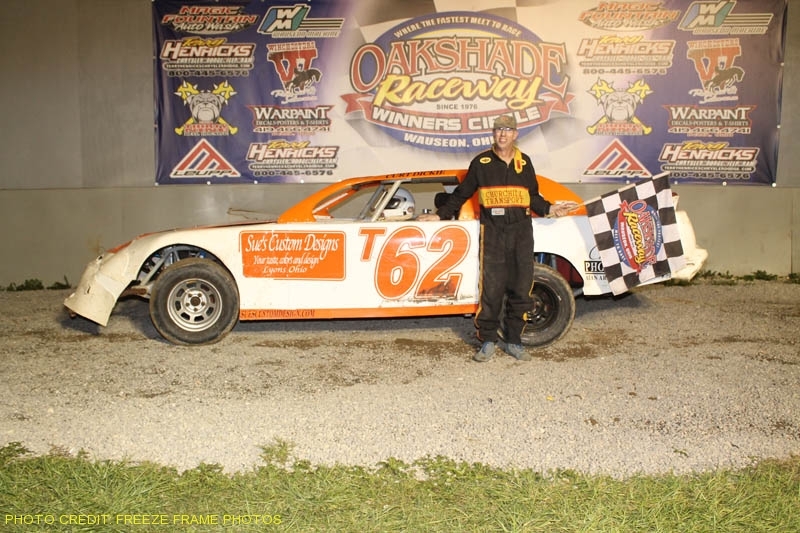 Then on Saturday, July 7th, it is Memorial Race night at Oakshade with lap sponsorships still available for the Late Model, Sportsman and Bomber A Main feature events. Contact the track at (419) 337-6850 for more information. The Hornet and Sport Compact class will also be in action. Gates open at 4pm with racing at 7pm on Saturday.